(that's where the road ends) is the worst. Violent and armed robberies are common. ”Now it's OK”, assured us locals with their typical Papuan calmness, when we asked them about the current security situation. ”Nothing has happened for a week already ...!” The situation in Tari itself has dramatically improved thanks to the presence of a police squad which is paid by the private Australian company building a new section of the highway. Such is the reality in a country whose capital city Port Moresby is unofficially crowned as the most dangerous city in the world. 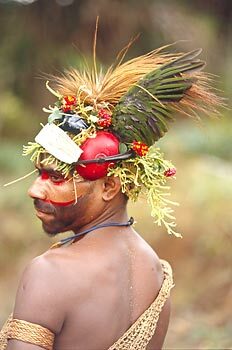 However, we came to Tari to learn something about the Huli culture – the famous Huli wigmen, who, on special occasions, traditionally wear flamboyantly decorated wigs made from their own hair and feathers of many rare birds of paradise. We were very lucky when we stumbled upon the son of one of the leading wigmen in Tari. Matthew is a university student but he understands the importance of his ancestral culture and was very proud of it. It took us two days to walk together to his father's village. We were happy to see that the Huli tradition is still very much alive (unlike most other cultures in eastern part of New Guinea island). 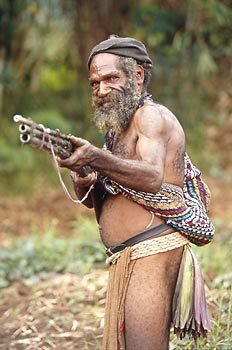 Although most men, except the oldest ones, wear western clothes on normal days, they all have their traditional costume and a wig for special occasions. And they happily show them off to the ocasional visitor, even seemed to enjoy being photographed. Unfortunately there are not many wigmen experts left who, like Matthew's father, master the complex method of making a wig. As the hair grows it is interlaced with a special construction and formed into desired shape. A man growing a wig must observe a number of rules and taboos. For example, he can only eat certain food, and is not allowed to have any contact with women. He also needs to sleep in a semi-sitting position with a head propped by special support. The whole process takes several months. When it's finally grown, the wig is cut off the head and is decorated with feathers, whole wings or even heads from endangered birds of paradise. An interesting experience we had on the way to the village, when we met a large group of warriors ready for the battle. They were armed to their teeth with homemade rifles or bows and arrows. They told us they are at war with the neighbours and must defend their territory. To us, however, they were very friendly and seemed delighted that we came to visit. When I asked for permission to take photos they came up with all sorts of crazy poses, obviously enjoying themselves. non-functional and really dangerous country. We still keep in touch with Matthew. We would like to thank our friend Matthew Timbalu for introducing us to his father, who is a famous Wigman, and helped us to understand a bit of the Huli culture.